Summer in Baseball means a lot of trade rumors. 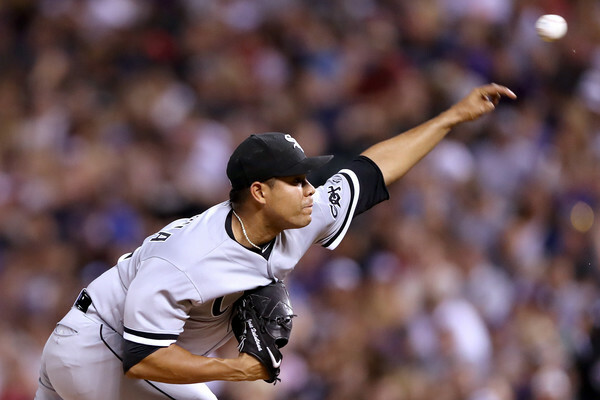 One of the consistent ones for over a year has been the Chicago White Sox seeking out serious prospect packages for Jose Quintana. The most recent list of interested teams includes the New York Yankees, St. Louis Cardinals, Toronto Blue Jays, Baltimore Orioles, Los Angeles Angels and the Kansas City Royals. Quintana, 28, is going through his worst season in the majors. The White Sox tried to move him during the offseason but couldn’t, but haven’t gotten the best of the Colombian lefty. He has a 4.49 ERA through 18 starts (104.1 innings), with a 1.323 WHIP (worst since first season in majors) and 2.73 SO/W ratio, also much worse compared to last season. His velocity hasn’t dropped (still around 92-93 mph fastballs), but he has increased his curveball ratio, which hasn’t been working all that great. Despite the disappointing 2017 campaign, he did perform well when all the teams mentioned came to see him, and perhaps other White Sox (41-45) players, during their 5-4 win over the Rockies. Quintana played for 5.1 innings and struck out 10 batters (he is striking out 9.4 per 9 innings, a career best for him). Quintana has also stated he prefers to remain with the White Sox, but that might not be in his control. Inconsistent or not, his contract remains a fantastic asset to have. He is owed around $3 million this season, $8.85 million in 2018 followed by a $10.5 million team option in 2019 and a $11.5 million team option in 2019. If this is only a temporary slump, that’s a financial risk well worth taking. Not all the teams on this list have the kind of talent pool to allow them a package the White Sox will go for. Either way, Chicago might be waiting for things to fall apart for them during the summer before they finally pull the trigger on a trade almost two years in the making.